Short haircuts for round faces are available in abundance, and so it is very unfortunate when men with such face shapes have trouble finding a good cut. The best thing about a round face is that it does not have any distinct lines and angles. It is also equal both in length and width and to choose the right cut you will only need to select the features that you would like to enhance. And for this, you can have anything from some short spikes to a fancy comb over. The 30 haircuts below will give you some ideas on some easy designs that you can wear on your beautiful round face. This cute cut is a fantastic design for a round face and it entails leaving some textured bangs on the top and giving the sides a taper fade. And to finish the look you only need to comb over the textured bangs on the crown. An excellent cut on the locks on top is an easy but elegant headdress for your round face. You should also make the sides short and finish by sweeping back the bangs. The texture of the short locks on the crown is amazing, and it is what makes this a top notch haircut. This style also has a skin fade on the sides that gives the hairdo an excellent blend and to finish the look you should brush the textured locks frontwards. Every gentleman with a short hair and a round face should try this fabulous headdress as it will make him stand out from the crowd. The style entails leaving some smooth strands on the crown and styling them into a sleek pompadour before finishing with a nice fade on the sides. This haircut is a unique take of the quiff because it does not have an up sweep like the others and it also has a messy look that makes it trendy. It is perfect for a round face because it brings a beautiful balance to the overall appearance. A comb over works for any face shape, but it seems to give a round face a unique appearance. In this design, the strands on the crown are not only smooth but they also look very soft, and all you need to do is sweep them to one side to create a perfect comb-over look. The taper fade on the sides of this haircut is amazing, and it makes it look very fashionable. And with such perfection you only need some wavy stands on the crown to create a perfect cut for your round face. Spikes will give your strands an extra dimension, and you do not always have to make them long because short ones like these are still beautiful enough. And if you pair them with a smooth taper on the sides you will look exquisite. Here is another haircut that shows the unmatched beauty that texture adds to your style. The strands on the crown have a dense texture and a front sweep that makes them look fantastic. And it you combine this with a zero taper on the sides then you can be sure of a refined look. Contrary to what most people think, a buzz cut will also work for a round face. However, if you want to look this good you have to make it extra short and also give it a nice skin fade on the sides. The feather light bangs on this design not only have a lovely texture, but they also have some beautiful waves and attractive styling that entails brushing them back in layers to create a perfect short hairdo for a round face. If you prefer to wear a fresh and neat gentleman cut, then you should try this one. You only have to chop the strands on the crown to less than an inch and then give the sides a clean fade. Although this haircut has a lovely taper fade on the side, the first thing that most people will notice is the up and side sweep of the wavy strands on the crown because they give the round face an extra height. The smooth taper on the sides and the perfect line up are the highlights of this cut. However, the messy crown bangs also help to spice up the overall appearance. There are limitless variations of the pompadour, and this one is a fancy one that entails decreasing the sides and giving the strands on the crown a simple side sweep to create a charming look. Rockabilly haircuts will also work for men with round faces. This particular one entails leaving some long brushed back bangs on the crown and giving the design a smooth skin fade on the sides. A clipper will always produce a beautiful haircut if it is in the hands of a barber with enough experience. In this style, it creates a pompadour like cut with some sleek and soft strands and a side part line. This haircut is a product of the skillful use of the scissors and it entails leaving some wavy and slightly messy bangs on the crown and tapering the sides to make them appear shorter. Short haircuts for round faces come in many sizes and shapes, but the best ones are the ones that keep things simple as this one. Here the design maintains some short bangs on the crown and a smooth fade on the sides, and you only need to finger comb the short bangs to finish the look. Blonde hair is ideal for any man who knows how to cut and style it. In this hairstyle, it has a simple side part and some smooth strands on the crown that you should finish with a slight side sweep. This beautiful headdress will only work for African Americans due to their natural hair texture. All that they need to create this look is to give the sides a sharp fade and leave a neat afro textured hair on the crown. Curly hair can also give you a cute haircut if you have a round face. To create one like this you should maintain some front swept and textured curls on the crown and give the rest of the hair a tight skin fade. With a simple twist, you can also make the Caesar cut work for your round face. 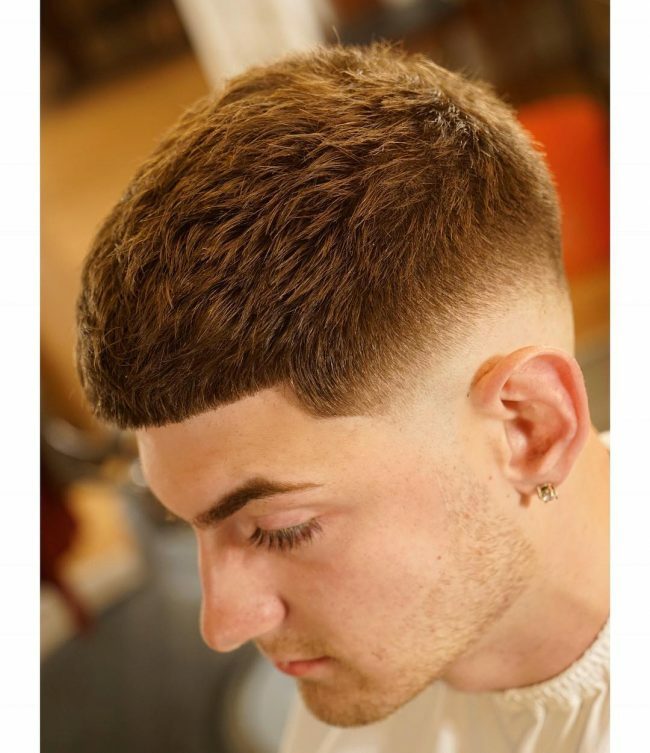 To do this, you will need to have a nice fade on the sides and give your traditional Caesar cut a simple line up to make it shorter and trendier. The smooth graduation from the long strands on top to the tapered sides and back is fantastic. Apart from this the strands also have a lovely color and a neat side part. This Will Smith haircut is an extra-short faded design that is also maintenance free. It is very elegant, and if you have a textured hair like his, then it is a perfect idea for your round face. The scruffy look in this design helps to make a round face detailed. And if you also have a smooth taper design on the sides you will look magnificent. Shadow fading is trendy, and it is what makes this short haircut look stunning. However, the hairdo also has some lovely curls on the crown that also add some dimension to the overall look. The dimensional locks on this design will impress any man and with such an amazing texture a moderate brush back is all the styling you need. This haircut also has a lovely taper and zero skin fade that makes it look exquisite. Distributing the long strands on the crown with a side sweep will give a round face a beautiful appearance. And to add some style to the haircut, you should also have a simple taper cut on the sides. The short spikes may definitely look good on you. Just add an undercut and a bit light on top of your hair. The beard will be a finishing touch. You should never lack ideas on what to try when it comes to short haircuts for round faces because there are many of them available. Go through the gallery above and choose one that conforms to your tastes and preferences.